Shop Essentials - Talon 1-3/8 Straight Pegboard Hooks - 6 Pk. Talon 1-3/8" Straight Pegboard Hooks - 6 Pk. You have picked your last pegboard hook off the floor! Made of unbreakable nylon, Talon Hooks are the "never fall" pegboard hooks. They have ingenious dual anchor and screw set in the back. Just push the screw in with your thumb and the hook holds rock solid. Pull tools on and off them all day, or all year long, and they will never come loose! Need to move or re-arrange the hooks? No problem! 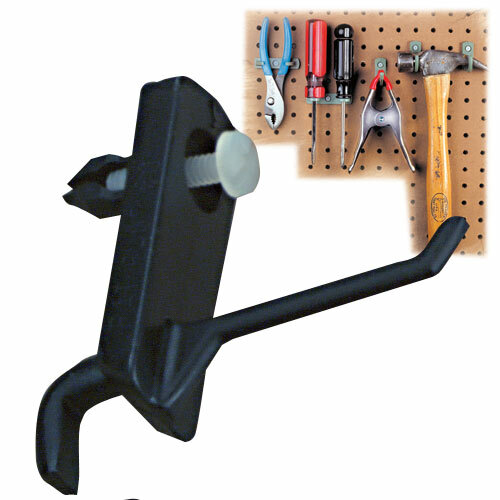 Talon Hooks are removeable, so they can be re-used or re-arranged anytime. Just grab your screwdriver to unscrew them, then pop them back in their new location.